Webmin is a web-based graphical tool for unix . It is used to manage services like User management, Disk managemet, Network, Iptables ( Firewall ), Cron, Apache, DNS, File sharing and much more . 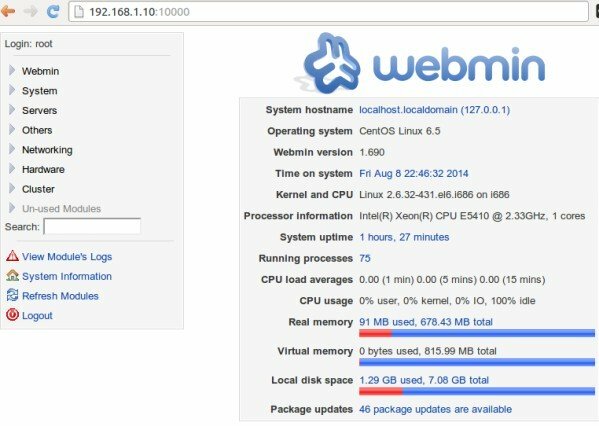 In this article, we can see about how to install webmin on centos 6 . Webmin installation on centos 6. Step 1 » Create a new file webmin.repo in /etc/yum/repos.d/ and add the below code. Step 2 » Install webmin GPG key using below command. Step 3 » Update the repositories. Step 4 » Now install webmin package using yum . Step 5 » Start the service and make it start automatically. Step 6 » By default, Webmin will listen on port 10000, Allow this port in iptables if it is enabled. Step 7 » Now open http://serverip:10000 in your browser, you could see the below screen after login ( Use root username and password ).